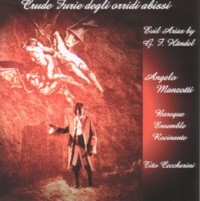 "Crude Furie degli orridi abissi - Evil Arias by G. F. Händel"
To produce a CD of arias sung by the “baddies” from Handel operas is a good idea. All the more since many of these arias are beautiful and rarely recorded. Although several of the choices are questionable: you can hardly find a character as far from being a villain than Faramondo, and are Serse, Arsace or Siroe really evil characters? At least this rather commercial approach is a good occasion to listen to Faramondo’s great aria “Voglio che sia l’indegno” or the dramatic “Deggio morire” from Siroe. The programme is really interesting and the presence of a CD-ROM containing the scores makes such a product being particularly attractive. However, what about the interpretation? Once more, the sopranist Angelo Manzotti offers us an extraordinary recording. He sings very high and quite low notes, but unfortunately, his singing is a demonstration of forcing. Consequently all those high notes and many others are out of tune and the vowels are distorted (on a long run you can ear three or four different sounds on a single vowel!). This frequently renders the text incomprehensible (“Peno tiranno” is not a rediscovered version of “Pena tiranna”!). Is it necessary to add that the passagio is weak and the “dramatic intensity” is too often obtained by an artificial vibrato and quavering recitatives? There are some moments in the lower lying arias which make one think Manzotti could have been a reasonable countertenor and some of his variations are really interesting, but even in alto arias he adds some terribly sung cadenze. His singing is never moving and not even impressive, just caricatured and unbearable. Good intentions do not make good singing. A very interesting programme, an excellent editorial policy, and a really good Finnish orchestra. Yet even if Manzotti certainly has some talent, this is unacceptable singing. People interested in sopranists should instead listen to the young French Philippe Jaroussky, definitely one of the best yet heard both in concert and on recordings.